A phone that may have been the Vivo Nex 2 - as this phone has been alleged to come with 10GB in RAM and the Snapdragon (SD) 845 appeared on Geekbench recently. However, another device from the same company with a completely different model number has surfaced on this same benchmark site. Oddly, this 'new Vivo' also has the SD 845 and 10GB RAM. Not long ago, it seemed that the Vivo Nex 2 had leaked onto Geekbench. A phone from this OEM with 10GB of RAM (a rumored attribute of the upcoming flagship) and the Snapdragon (SD) 845 processor, as well as Android 9 (Pie) achieved a single- and multi-core score in line with what may be expected of a phone with these specs. However, now, a second Vivo device with the exact same details has popped up on the same rating system. This phone was listed under the model number vivo 1813, whereas the initial 'Nex 2' had the number V1821A. Nevertheless, the device was, again, listed as using 10GB of RAM, Android 9 and the SD 845. Its Geekbench score compared well with the earlier results, posting 2371 in single-core terms and 8326 in multi-core terms. This means it beats the 'other' Vivo 10GB device for the former and narrowly loses to it for the latter. It is not clear at this point if these two results somehow pertain to the same phone, under different or adjusted model numbers for some reason. 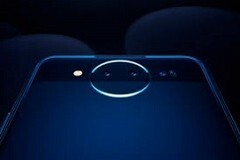 Another possible explanation is that Vivo is hedging its bets by preparing a second, more conventional, yet equally high-end alternative to launch alongside the 'experimental' Nex 2. This theory is given weight by the fact that the phone formerly discussed under this name launched today in India, and is in fact called the Nex Dual Display. Therefore, the 'vivo 1813' may pop up as the actual 2 sometime soon.